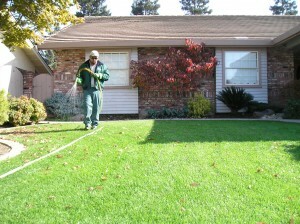 Our lawn care service begins with a free, no obligation landscape analysis. The certified landscape technician will inspect your property and provide you with a personalized program that addresses your needs and a price quote for those services. We have a responsibility to our environment that we take very seriously. That is why our vehicles are designed with injection systems that provide the best possible weed control in an effective as needed basis. We do not apply blanket post emergent herbicides! When we make a lawn application of our custom blended fertilizer and weed controls, we leave behind an invoice with watering instructions, and a detail of what products we used. We Guarantee the performance of our programs. If you are experiencing a problem, or are dissatisfied, please call, we’ll send our specialist out to correct the problem. We at RX Lawn Care Solutions want satisfied customers and will keep working to assure that you are pleased.